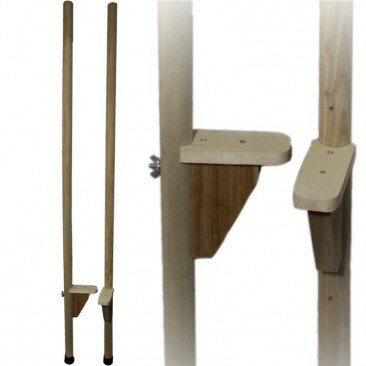 These sturdy wooden stilts are made out of ash, which is a good strong wood, capable of supporting up to adult weight. Their sturdy construction will mean that they should last a long time and withstand the rigours of a playground. The easily adjustable footplates can be moved up or down to adjust for users of different heights. The foot blocks can be set at 32cm, 41cm or 50 cm. 160cm high poles with rubber feet are suitable for children, teens or short adults.